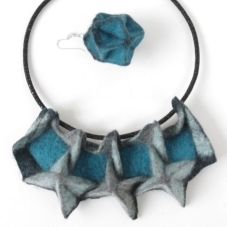 Taking inspiration from origami artists such as Paul Jackson, Eric Gjerde and others, Andrea will guide you through the process of creating intricate, yet striking three-dimensional constructions and foldings that can be used to form felted jewellery and small objects. The workshop begins with a paper model to get you familiar with the folding techniques, before moving on to produce the prefelt which forms the basis of the workshop. Starting with a flat prefelt surface, during the process of felting, you will build up defined and clear edges and forms that will be durable over time. 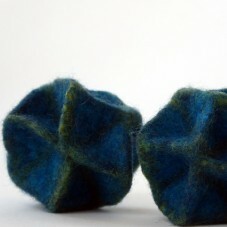 In this way you will create your felted jewellery pieces or small objects. 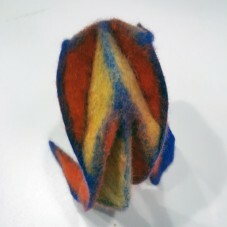 This unique approach in handmade felt is also applicable to other projects and felted forms.